Most people don't look at any news, or at one news site; using social media a lot (even without the intention of looking for news) means that sometimes you'll end up clicking a news link -- so heavy social media users, on average, are consuming a wider media diet than those who do not use social media. It's still possible to construct a perfect filter bubble for yourself using the internet, and that's easier than the pre-internet era, when fringe participants had to seek out and subscribe to postally sourced printed newsletters. But once you take to the forums and walls to argue about your filtered beliefs, you are still more likely to be exposed to sources that don't share your tenets. For example, about once a month I find myself accidentally clicking on a link to a Daily Mail story -- whereas during 13 years in the UK, I never once read a story in the Mail's print edition. 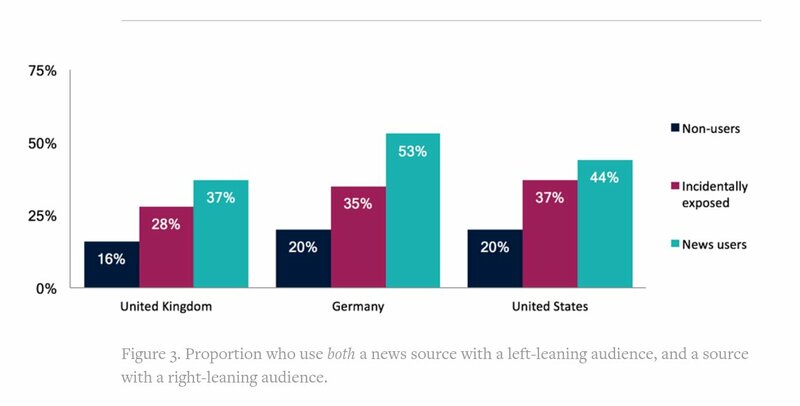 The original research from Nieman Lab is very good, and points out that our split isn't so much about where we get our news as how we figure out whether to trust it. As I've written before, we're in the midst of an ontological crisis: we've lost the fragile consensus about how we know things are true. Statements from the President, from panels of independent scientists and from peer-reviewed journals no longer carry the ring of truth for large swathes of people whose old rule of thumb was to trust those sources. So the question of whether we're reading diverse news-sources isn't as important as whether we have broad convergence on how to know whether to trust those sources.